As reported in the Brooklyn Paper this morning (and on Brownstoner), the new East River ferry service is set to begin service in mid June. I met with the operators of the new service a week or so ago, and am very excited about the new service. As you may have guessed, I have been a pretty frequent rider on the former Water Taxi service. The service that NY Waterway, the new operator of the route, will be implementing in two and half weeks will be a vast improvement over the Water Taxi service (thanks in large measure to city subsidies). Instead of two or three boats in the morning and two or three boats in the afternoon, the Waterway service will run continuously from 7 in the morning to 8 at night. And instead of an hourly schedule at each stop, the new service will have boats departing every 20 minutes during peak commuting hours and every 30 minutes other times. Add in new ferry stops at North 6th Street and India Street, and all of a sudden ferry service on the East River is a commuter service on the city model, rather than the suburban model. No longer will you have to make the 8:30 boat or risk an hour wait for the next boat (or a long walk back to the J train!). 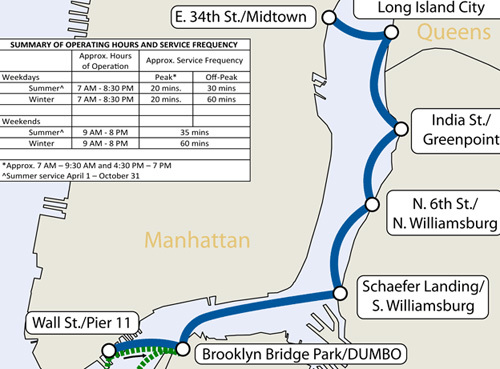 The additional stops on the Northside and in Greenpoint will bring the ferry service closer to a lot more commuters. And for people commuting to midtown, there will be a shuttle bus running in a loop from 34th to 42nd Street, so there is the prospect of a single-fare ride. Another bonus for residents of Long Island City and north Brooklyn is the weekend service, which will also run on a half-hour schedule and will include one-boat service to Governor’s Island! Things still won’t be perfect, though. For most commuters, taking the ferry will mean two fares – until the MTA and the City figures out how to do MetroCard transfers from the ferry to the buses and subways, commuting by ferry will only be viable for people who live and work close to the ferry stops (on the other hand, if you live in northern Williamsburg or Greenpoint and work in DUMBO, you now have a pretty direct commute, and if you live in Greenpoint and work in Midtown, you could conceivably kiss the G train goodbye). I’m also concerned that NY Waterway’s bike policy will make it harder for people to commute on two wheels. And even with city subsidies, the service is not cheap. A discounted fare will run you about $4, which is a bit less than the Water Taxi charged, but still more the twice the cost of a subway fare with a monthly MetroCard. This – and the transfer issue – is something that the city needs to come to grips if it wants intra-city commuter ferry to work. But all in all, the changes coming with the new NY Waterway service are very good first steps to making that kind of service a reality. Update: Had an email from the ferry folk saying that service will start “mid June”, not on the 13th. The sooner the better.